Having recently started being interested in HF Linear Amplifiers I needed a voltmeter to measure the High voltage on the anodes of the valves, I have a Bradley meter but it will only go up to 1.2 KV and I needed a 2.5 KV voltmeter to monitor the voltage on the Linear Amp that I was building. For the dropper resistor I decided on a chain of .5 watt metal film resistors, these have a voltage rating of 500volts so you would need a least 6 resistors in series to be on the safe side. I decided to be extra safe and have a chain of 19 X 1.5 meg-ohm resistors ending with a variable resistor for calibrating the meter. Although not necessary it is best to put the variable resistor and the meter on the earth side of the circuit where the voltage in the circuit is low. To calibrate the meter, I used a Variac transformer to set the voltage on the power supply to 1KV with the Bradley meter then using the variable resistor set the voltage on the 100uA meter to 1kv and the job was done and the meter was ready for wiring into the linear amp. 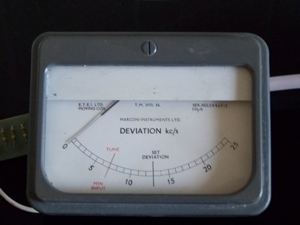 Although this meter has been designed for 2.5 KV using the formulas above you can measure any voltage. This article comes with a health warning HIGH VOLTAGE KILLS, make sure your dropper resistor chain is properly insulated as high voltage can arc across an air gap. If you want to build a stand alone voltmeter for high voltages make sure you use a good insulated box to put the meter in and hard wire the high voltage leads into the insulated box, High Voltage Probes are essential. Valve Linear Amp Safety Electrolytic’s! DON’T BLOW YOUR FUSE!! !